Mike with the Surrey Branch members at The Stepping Stones pub, Westhumble. The Surrey Section welcomed our President Mike Jackson to our clubroom on 13 June 2018 and there were 34 Surrey sections members and a guest who came along for his talk. 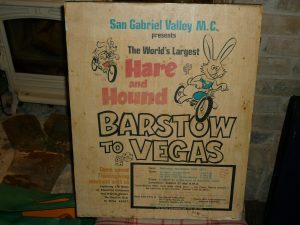 Mike began with showing us a poster from the Barstow to Las Vegas desert race with 3200 riders participating in this event. He then went on to explain to us about desert racing, its history and how it had all started. There is a Smoke Bomb he said that was made up of a pile of old car tyres, and every one had to head for that. Mike explained the reason there was so much dust at the start of the film, in the desert racing section, On Any Sunday, was due to a helicopter that was filming and being so low to film the start of the event that it stirred up all that dust that the riders had to race through. Then it ended in Las Vegas and riders were still coming in to Caesars Palace many hours after the race had been won. They were cleaning off their bikes in the fountains, and on one side of the road with the limos and all the people looking at this peculiar spectacle-taking place. This was the event’s nighttime HQ at Caesar’s Palace Hotel, long after the race had officially finished. This was moved to Caesars Palace after dark, if the riders finished at Caesars Palace, they never were placed. 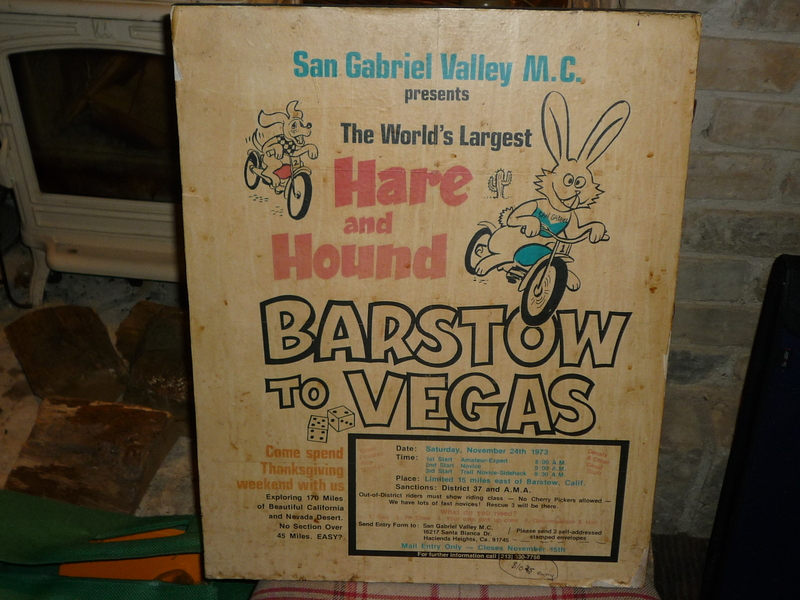 This Mike put in for my own benefit, as I am very interested in the desert-racing scene in District 37, Mojave Desert from the 1940’s through to the 1970’s. Mike was with Norton for 15 years, and he joined AJS and Norton in 1969 after six very happy years with Greeves Motorcycles in Essex. The assembly of bikes was at Andover with the engines and gearboxes being built at Wolverhampton. After a few months, he upset the CEO as he was doing what he had done at Greeves, and he was forced in to a transfer to Norton Villiers Corporation, NVC. He was moved to the NVC facility in Long Beach, in California. Mike joined Norton Villiers at Andover on 1st May 1969 in the position of AJS European Sales manager. Bob Mans was the long-serving UK sales manager for Norton, and he moved from Plumstead to Andover at that time. Where after Mike and Bob shared an office for the next 11 months. During this period, Mike rode and learned about the Commando’s. Bob Manns never worked in the USA. When Mike returned to the UK, by then the company was known as Norton Villiers Europe and he was appointed the sales manager. After this, he was appointed director for AJS and Norton for all of Europe. At that point, Bob Manns was appointed to the vital role of Chief Test Rider. Bob Manns, who later became the chief test rider at Norton Villiers, was the UK Sales Manager, Mike shared, an office space with Bob when he returned to Andover. He took the Commando sales job and he had only ever ridden six road bikes when he went to Norton Villiers and he clearly had a lot to learn, when he went over to the Commando side. Mike was primarily an off road rider and racer. All this time Norton was a very small company in North America and the Berliner Motor Corporation were the sole distributor and importer of Norton’s and they also had many other brands Pirelli, Metzeler, Moto Guzzi, Ducati, Zundapp, and Sachs of bikes and products that they also sold along side Norton. Joe Berliner assumed the importation of Norton’s after an agreement was reached with Bert Hopwood after AMC had refused to let Norton’s be sold though their importer the Indian Corporation. In about 1962, Joe Berliner then took over from the Indian Corporation as the main importer of AMC’s products. Norton in the 1950’s was a small company in North America as well as in the UK and Bracebridge Street only employed about 150 personnel, and they always managed to punch above their weight. While over 1500 worked at Triumph at Meriden, and the workforce at Small Heath for BSA was around 5000 employees. Norton’s sent bikes direct from their UK factory to Berliners three warehouses, in New jersey, Texas, and Washington. After which these bikes were sold to the 13 distributors who then freighted the bikes to their appointed dealers in the stated in which they traded. Norton only once exceed 10,000 Commando’s in one single year of which 4500 bikes went to the North America, and 4000 bikes went to Europe. Dennis Poore negotiated seven states away from the Berliner who were was located at Hasbrouck Heights in the state of New Jersey, so NVC (Norton Villiers Corporation) sold to their own dealers and they then had control of their own dealers. By an agreed contract Berliner (with 43 states) had to purchase the same quantity of Commandos as NVC who had seven states. The Berliners had agreed to buy as many Commandos’ as did NVC in Long Beach. So if Long Beach in California sold many Commandos’ so did the Berliners, sell many Commandos. In 1971, Mike did a six-week tour of all their new dealers of the smaller ones of which these were known as Mom & Pop dealers. By 1970 Norton were producing 7 to 8000 bikes. The Roadster out sold the Fastback as the Americans just did not understand the Fastbacks concept, so the Commando Roadster was Norton’s bestseller. The tooling for the new front disc brake cost Norton £30,000 from Lockheed, as this was before the Combat debacle the Combat debacle turned around and bit Norton hard. Against the advice of the design personnel Dennis Poore pushed for the Combat engine to be installed in the Commandos. Mike Jackson completed his 2-year USA stint and he returned to the UK in the middle of the Combat engine crisis. Dennis Poore took the blame for the Combat engine crisis. The 850cc Commando saved Norton and over 20,000 bikes were produced. Mean while the Japanese had increased their market for motorcycles so Norton sold more bikes. Mike then showed us some of his Norton Girl posters. In 1968 Dennis Poore did a research tour of the USA in 1968, where after the inside of the cover of both publications was “booked” by Dennis Poore, “ in perpetuity” of Cycle and Cycle World for over four years. Honda had tried to get that cover but the magazines did not let Honda have it. Norton photo sessions used to consume two days to complete, and they used to have an engineer in attendance with different petrol tank colours and side covers to change the bikes colours. During a Formula 750 race meeting, Bob Trigg and Mike Jackson went for a walk around the car park at Laguna Seca to look at what were then being ridden and the bike fashions at that time. Many of them were choppers so Bob Trigg sketched out the Hi Rider bike. 100 Hi Riders were made but only 50 were sold and the other 50 bikes were converted to Roadsters. In 1970 Norton’s were offering seven different colours for their bikes. Dennis Poore was very closely involved in Norton’s advertising. In Mike’s 6-week 3500-mile tour of all Norton dealers to the west of the Mississippi, he visited every smaller, rural dealers the Mom & Pop type. Bill Colhuhoun flew to between the large cities and called on the bigger shops. Mike’s company transport was a 5.7 litre, or a 350ci V8 Chevrolet Camaro, with a trailer towed behind the Camaro. At a time when a US gallon of petrol cost about 30 cents and the bank gave you $2.40 for every pound sterling you gave them. Talk about Paradise lost said Mike. The orders were sent either by post or by telephone. All the Commando posters were taken from the drive side, and this was because the photographer took one side and then stuck with it. This state of affairs was not picked up on until much later on. 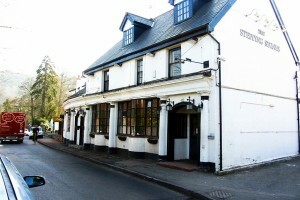 The Norton Villiers take over of Triumph with government promises and this is what broke Norton. Norton Villiers had many orders for the Triumph Trident models and due to the blockade and this is what cost Norton so dear. They were selling Norton, Triumphs together and there was a promotion at that time, and they were giving £75 for every Triumph Trident sold. The pictures that they took for publicity purposes were staged on cobblestones and to get the shot the cobblestones were flooded. The pictures were taken out side the public house The Prospect of Whitby that is in Wapping, or East London. The staff at Norton Villiers Triumph called the NVT logo the tadpole as it was not received very well or actual liked by the personnel at NVT. An error in those inside cover pictures was never rectified. This was to picture the Commando from the near side, but no one ever noticed or mentioned this mild mistake at the time. Only about 30-production racing Commando’s or the Yellow Peril were constructed in 1970. Rex Butcher and Norman White won the Thruxton 500 production Race on a PR Norton. Norton at Bracebridge Street from the late 1940 has or in 20 years only constructed about 35,000 twins and Norton was a very small producer of motorcycles. Mike showed us many of the Norton posters that had come from the factory. He also showed us a low cost advert for Phil Read’s 4th place at Daytona. 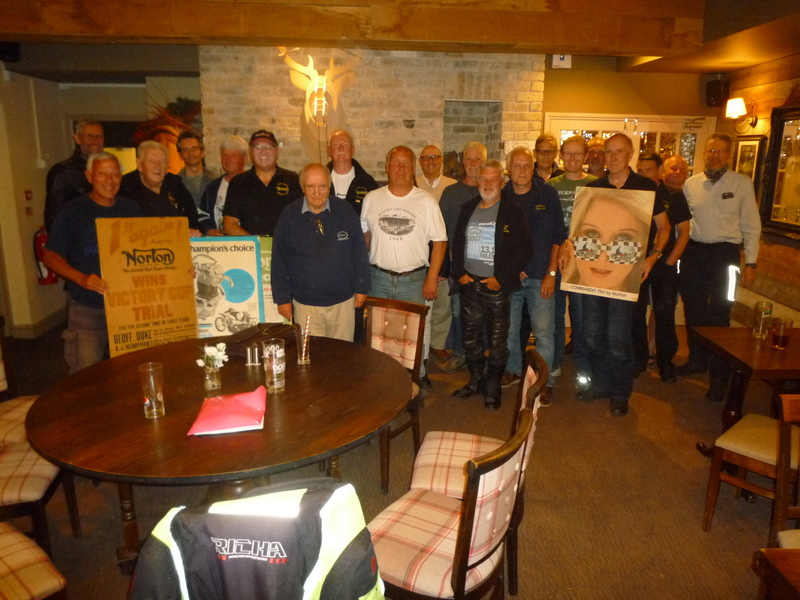 Geoff Duke joined Norton as a scrambler tester and he won the Victory Trial, and Mike displayed to us this poster. Mike brought along many of these factory posters that the company had thrown away and had one of his colleagues put them on to hard board so that they could be shown and preserved much better. Mike’s talk was an amazing insight into the workings of Norton and from the perspective of the management’s side of the company’s workings. All those that came along were enthralled by Mike who has such a commanding presence and he delivered his talk with such an amazing carefree attitude that made his story of all those years he worked for the company come to life before our very eyes. Mike explained that he must have had the very best job in the whole of British industry at that time; as he said himself, “flogging Commandos during the week, then racing in the desert on a sweet running AJS Stormer every weekend”. If you have, the book that was written by, Don Morley titled Classic British Scramblers then look on page 32, and there is Mike Jackson racing an AJS Stormer. The caption explains “The American’s, at least took to the AJS Stormer and used it as a desert racer. Here Andover Norton director Mike Jackson, the AJS man in the states, leads the annual Barstow to Las Vegas race” The above statement as shown on page 32-33 of Don Morley book Classic British Scramblers is incorrect. He was lying 185th at the first Pit Stop, (40 miles from the start) and he was not leading the Barstow of Las Vegas desert race. He finally got up to 14th place at the end, and there were 3200 starters. The Surrey section would like to extend a huge thank you to Mike for his talk and his presentation and that evening was such an amazing and enjoyable experience for all those that came along to experience it. For all those that could not come along to Mike’s talk you missed an amazing experience, which was an event not to have been missed. One of many of Mikes ‘Lantern Slides’ used to punctuate and illustrate his entertaining and informative presentation.